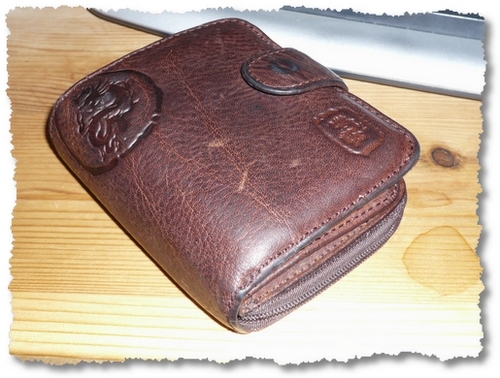 Here’s a picture of my wallet as it is right now… It’s quite a bulky thing, but that’s probably because of all the crap I keep in it! I don’t usually carry it in my pocket! It’s in my bag most of the time. So, let’s see what is in it! It was helpful, I threw out the old calendar, and reminded myself to renew my car registration; I also have to stick the Insurance Sticker on the window, just in case. OK. So here goes: who’s going to follow me in this meme! Let’s see if Elizabeth at Table for Five will…! Do mention in the meme: This meme was started by InvestorBlogger. Wow, you had a lot in your wallet! I’m afraid mine is a bit empty at the moment, but I’ll still take some photos and post the meme tomorrow! A couple years ago I switched to a Jimi ( http://www.tombihn.com/page/001/PROD/ACC/JIMI ) and what a difference it makes. 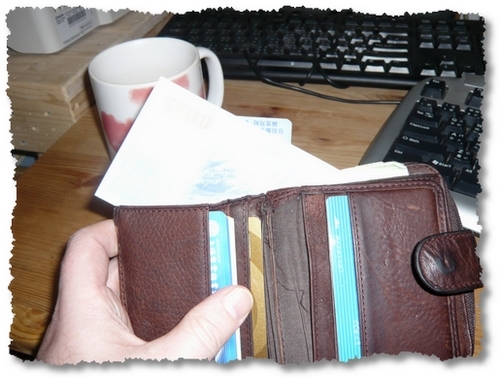 Along the same vein is the Wallet 2.0 ( http://www.popwuping.com/stuff/bags/wallet-20.php ). Sorry, but I had a look at the websites, It’s really TOO small for me!